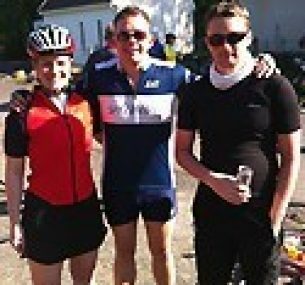 In May 2012 Stuart Byford, Katie Nicholas and Mark Foster cycled from London to Paris to help raise funds for Children with Cancer UK. Katie and I spawned the idea. We both wanted to get involved in an endurance event to raise money for a worthy cause. We hoped to raise a decent sum of money with our employer, BP, matching what we raised. We had seen some Children with Cancer UK campaigns and decided they would be who we would support. Our choice was not from first-hand experience of children with cancer, but more from an understanding that every child deserves the opportunity to life – to grow and to live their dreams.Sadly one in three of us get cancer. As adults, many of us have first-hand experience of cancer from friends and family who have developed it. In many cases, thankfully, they have pulled through. In others, sadly, they have not. As adults we understand its severity and the strength shown by those fighting it. Children don’t have that understanding and it can be all that more frightening. Cancer doesn’t have prejudices nor preferences. The thought of friends and family suffering from cancer is sad enough, but for innocent children it is all the more unfair. So our choice was not from first-hand experience of children with cancer, but more from an understanding that every child deserves the opportunity to life – to grow and to live their dreams. They simply didn’t deserve to get cancer…so what could we do? Let’s raise awareness and get on our bikes! Training took many months and at times the routine was very hard – the simply shocking weather over the last few months in the UK didn’t help. We trained in gyms, swimming pools, on the road and by running half marathons – anything to try and break it up and to stay dry! There were several punctures, slips and crashes and a couple of bruises picked up along the way!On the first day of the event we were met with strong winds and horizontal rain which lasted for two full days – 175 miles in total. There were several punctures, slips and crashes and a couple of bruises picked up along the way! We had a website running which was tracking our progress every 10 minutes via a GPS tracker I was carrying. If we were going too slow, or were seen to have stopped for too long, then the text messages would come in from friends and family thinking we had given up or were instead in the pub! We were actually changing punctures or taking well-earned rest stops; stocking up on jelly babies and isotonic drinks! The ride became a blur as we raced the last 50 miles to the Eiffel Tower. On arriving at our final destination, with a team of 134, we cried out of joy from the sense of achievement. We took a team photo and drank a small cup of champagne, gratefully received from one of the event organisers! Many friends were made along the way and many experiences captured. But most importantly…many £’s were raised!